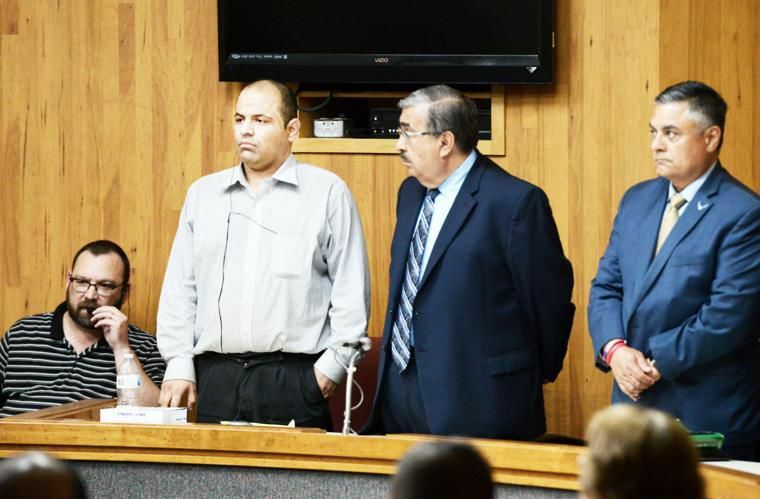 Gustavo Tijerina Sandoval, second from left, stands stoically as he faces the grand jury as Cameron County State District Judge Migdalia Lopez reads the verdict and finds Sandoval guilty of capital murder Wednesday afternoon in Brownsville for the 2014 slaying of an off-duty Border Patrol agent. BROWNSVILLE — A jury yesterday sentenced a man to death for the killing of Border Patrol Agent Javier Vega. The jury also sentenced Gustavo Tijerina-Sandoval, a Mexican national, to life in prison for the attempted capital murder of Vega’s father. The jury also handed him a $10,000 fine. However, the death penalty triggers an automatic appeal to the Texas Court of Criminal Appeals. Jurors convicted Tijerina, 34, of capital murder in the 2014 killing of Vega Jr. during a family fishing outing. On that fateful day in August 2014, three generations of Vegas were at the scene near Santa Monica where Tijerina attempted to rob the family, prosecutors said. According to court testimony, Tijerina owed $3,500 to someone because he lost a vehicle engine and that person was threatening Tijerina, so he concocted a plan to steal a vehicle. During closing arguments, Willacy County prosecutors said Aug. 3, 2014, started out as a day of family time, with some shooting practice in La Feria before the Vegas headed out to a fishing spot near Santa Monica. Tijerina cased the family while driving around in a red Ford Expedition, following them down to where the family was fishing. Javier Vega Sr., his wife, Javier Vega Jr.’s wife, two of their children and a friend of the kids were all at the scene that day. During testimony, the survivors all pointed out Tijerina as the man who pulled the trigger. The prosecution brought 44 witnesses, including eye witnesses at the scene and corroborating witnesses, and presented the jury with 340 pieces of physical evidence, including scientific evidence such as DNA and fingerprints found in the red Ford Expedition, gun residue found on Tijerina’s hands, bullet casings and reconstructions of the crime scene. His co-defendant, Ismael Hernandez-Vallejo, 44, also accused of capital murder, is still awaiting trial.